Yesterday morning, my husband called to me from his home office asking if I ordered a "shepherd's hook" from Amazon. Of course I had. It's a tall metal pole for holding a bird feeder. He just got a text that it had been delivered! Huh...I thought I had ordered it through my own account (I had, in fact, but the Internet knows all), but how nice of them to let me know. I went to the front door in anticipation of setting it up in my yard right away, only to find no package at all had been delivered. Not again, I thought. We have the misfortune of living on a street with the same first two letters as the street parallel and a block north of us. Packages are frequently misdelivered. Maybe it's due to the horrors of students who were taught to read using sight words instead of phonics. Or maybe it's just a momentary lapse on the part of the letter carrier. Or maybe she just doesn't care anymore. My package was not delivered to my home, nor to my northern neighbor. As evening approached, I searched the USPS customer service page, but it was no use. My package was declared "delivered" and I was out of luck. As I was about to type a note of complaint, the doorbell rang, and there stood a man with a tall cardboard box. He lives 5 blocks away on a street with an altogether different set of letters making up the word, but the same house number. It was super-nice of him to do the gov't's job! 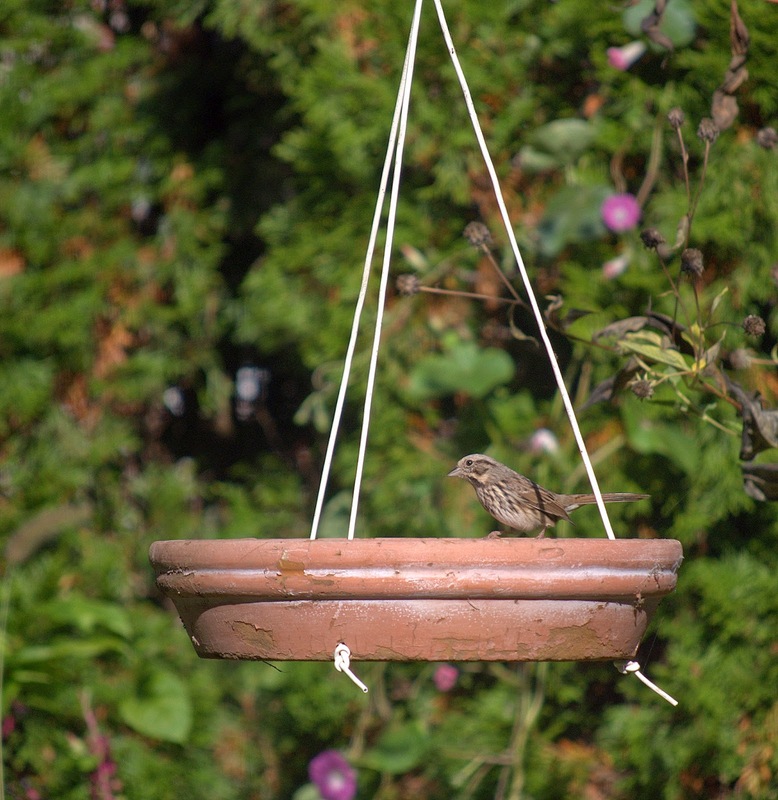 I set up the shepherd's hook just beyond the dog's reach and made an old planter saucer into a hanging dish-feeder. I filled it with wild bird seed. For some reason, wild bird seed comes with candied papayas. The ants love candied papayas, and climbed 5 feet up and one foot down the hook to enjoy the sweet treat. I look forward to woodpeckers eating the ants. No feeder visitors came by last night. Not one. This morning, ever hopeful, I poured my coffee and sat outside with my camera. 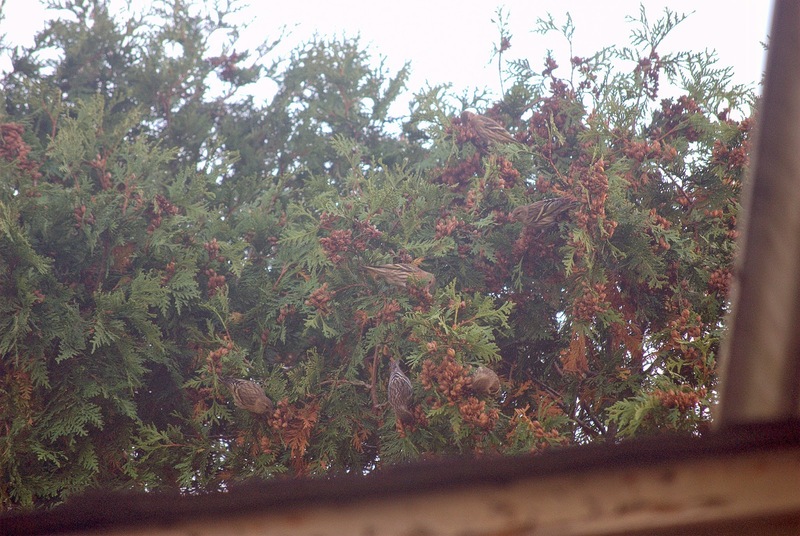 There were birds everywhere, thanks to my neighbor's dying cherry tree. He took down a blue spruce in perfect shape, removing the breeding spot for several generations of crows. He took down a row of arborvitae I-know-not-why. He has threatened to take down a smaller tree behind the garage. But this leviathan cherry, with dead branches and hollow trunk, just waves violently in the lightest breeze waiting for the gust that tears the branches off, and for gravity to do her worst, right over my yard. But I can't really complain, since the tree provides constant shelter for my friends the birds. 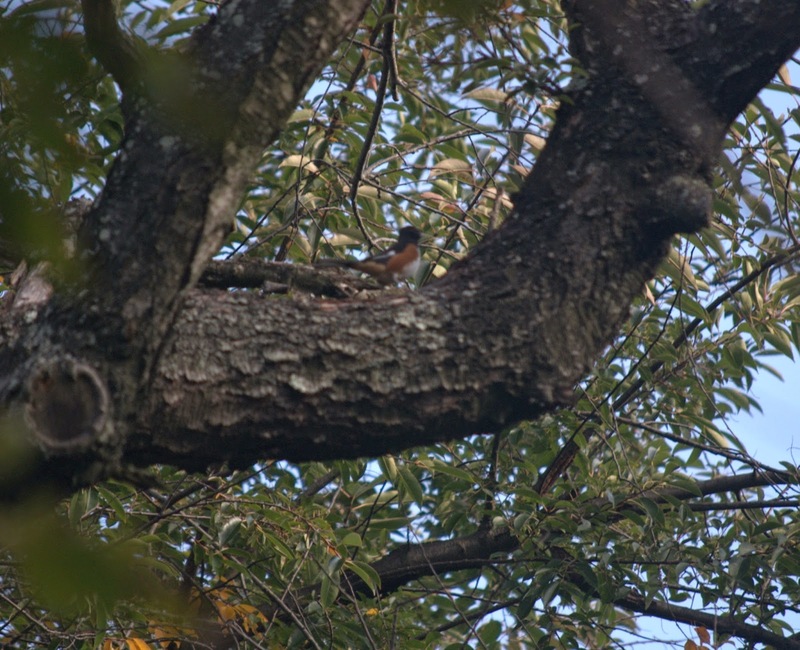 Today, I saw a towhee in my yard (technically, in his tree which extends over my yard) for the first time! As you can see, I got a photo for ID, but it's not beautiful. 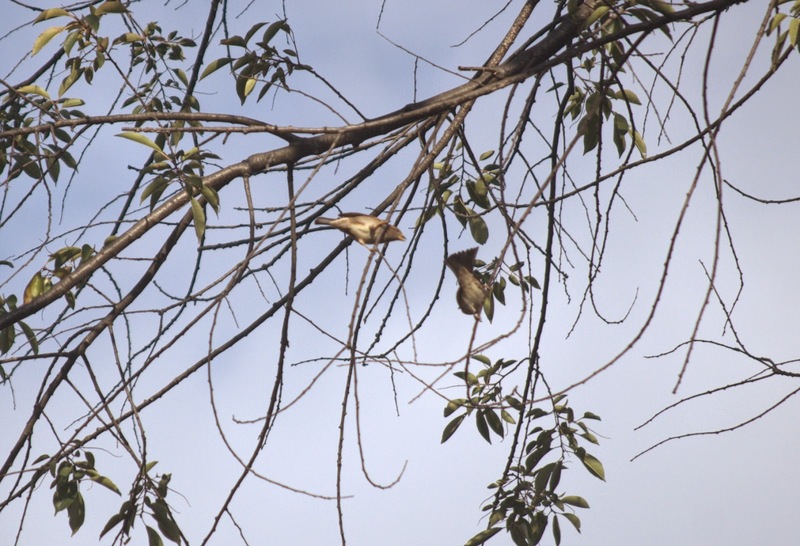 And a pair of unidentified birds played way up in the branches, refusing to turn for proper identification. Any guesses? Unidentified birds in classic Audubon pose. 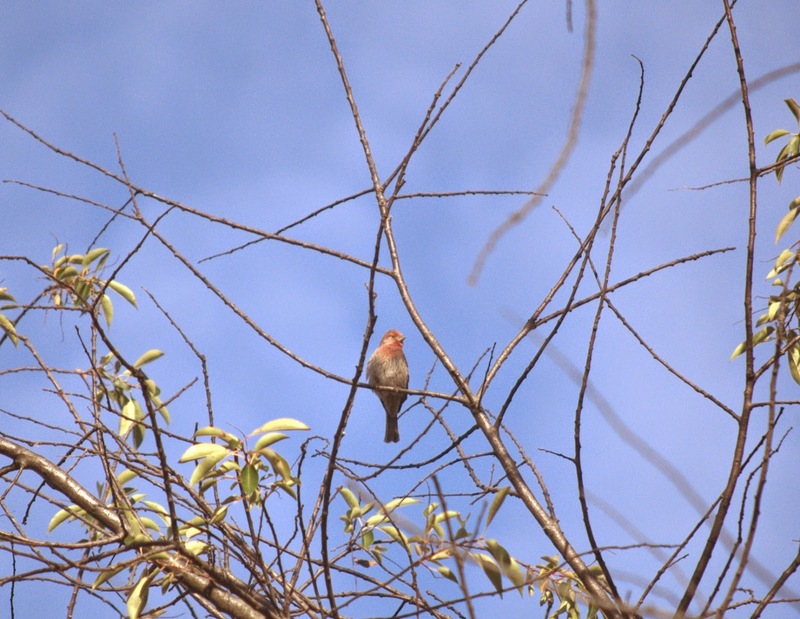 A house finch stood out red against the blue sky. He was having a great day! 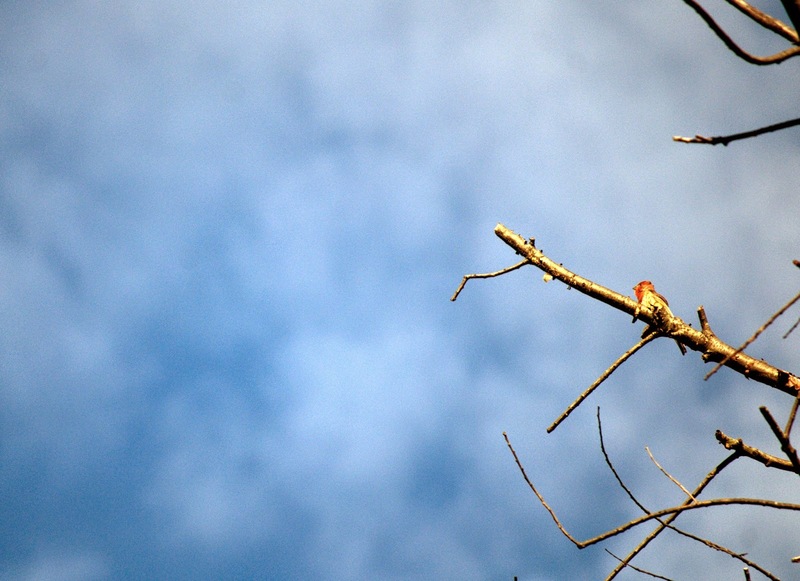 He likes the high branches, where the wind whips his feathers. A medium sized hawk--possible red-shoulder from the looks and cry--swooped onto the branch, but my little friend spied him early and fled. A bit later the hawk swirled away, to the south. Sorry, no photo. He's one that got away. But some other interesting birds were visiting. I looked at a bird in the hedge, and saw a pine siskin! It's the first I have seen in the yard. It had not come for the seeds I put out, but for the tiny conifer seeds in the hedge. I took a few photos. 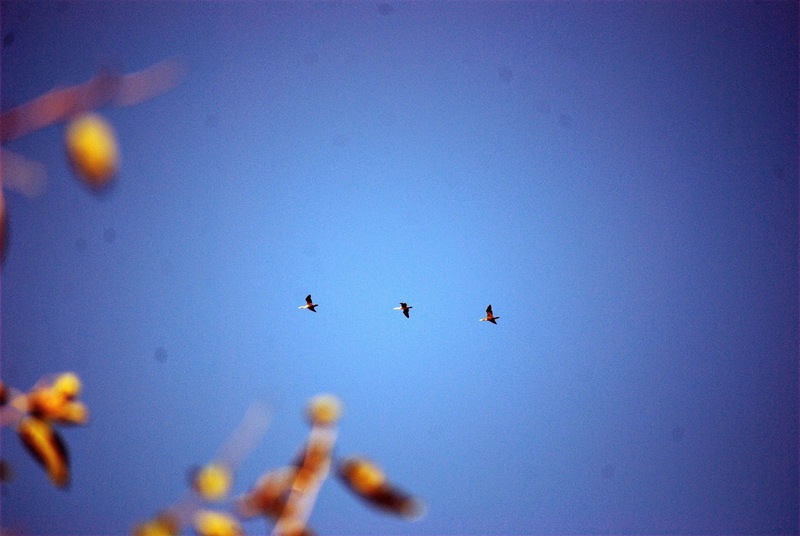 Imagine my surprise when I opened the photo in Picasa and saw that there were 6 birds in the photo! Can you see them all? Did I miss any? 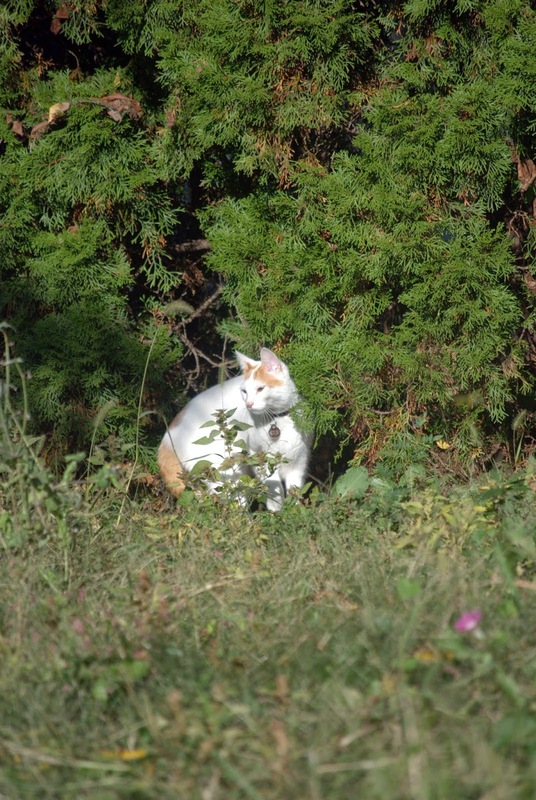 The birds are pretty well camouflaged, but Amigo, the cat next door, is not. His white fur shines brightly in the morning sun. 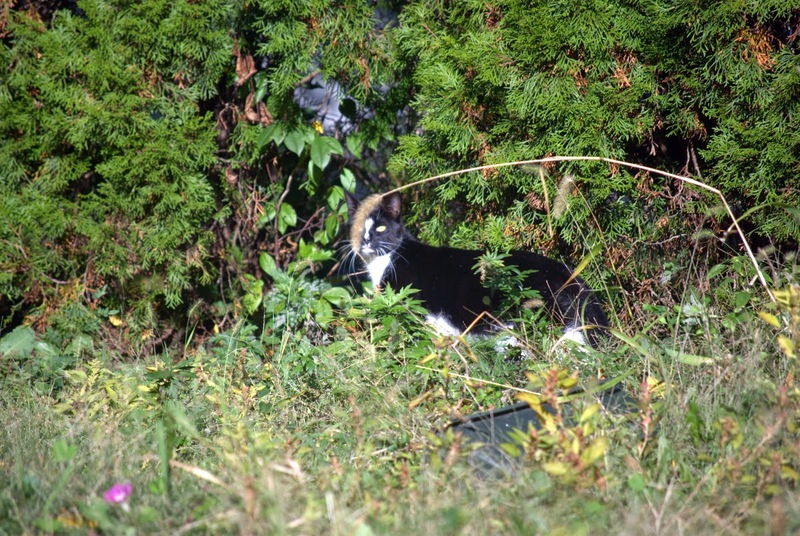 Whiskers, the cat next door on the other side, is a bit harder to see in the shadows. Both would like to nab a bird, but the birds are well guarded by Circe. Not that Circe has not nabbed a bird in her day, but she'd rather have cat. Finally, a visitor landed on the new feeder. This song sparrow is brave and patient, and not afraid of Circe at all. Still looking up in case the hawk came back, I saw a flock (well, three) of something go over. A closer look through binoculars showed them to be greater cormorants. That was nifty. And though it was only 65 degrees out, a few honeybees were sucking the last of the autumn nectar. Despite the cold, they were faster than my camera, and I only got a good shot of a foot and wingtip as it explored the morning glory. 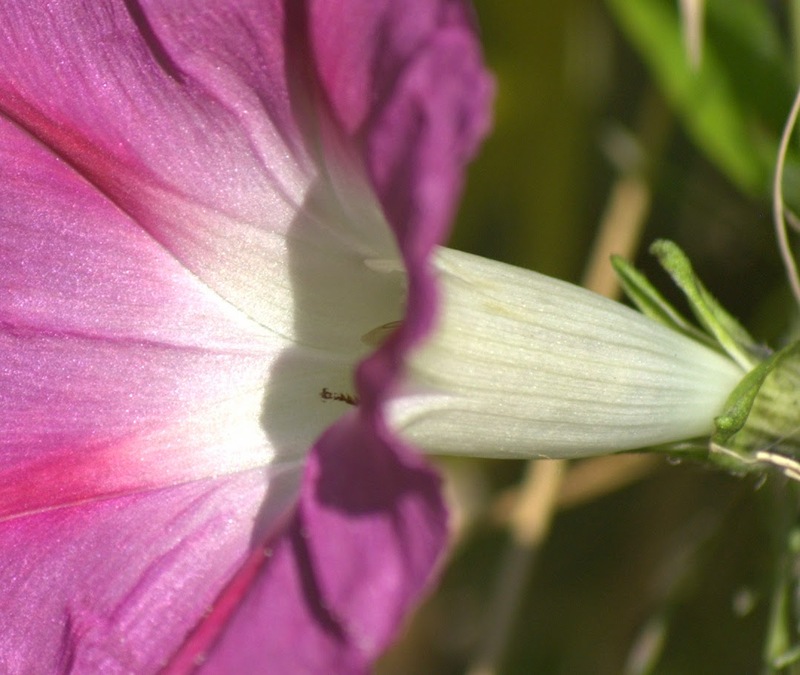 Morning glory food for bee. Meanwhile, the rubbish men came by, some workmen tore out part of our sidewalk, old Greta-two-doors-down yelled at her daughter-in-law in Deutschlish, someone rang our doorbell, sprinkler men came to fix the neighbor's sprinklers, landscapers mowed, leaf blowers moved the leaves around, the fire siren went off, and, in the distance, a chainsaw made short work of a tree. I had coffee and birds, and was almost oblivious. Dollar store shopping on a Sunday night. Couple in front of me has 25 items. Girl-who-scans makes short work of the order, skillfully turning each barcode to the laser as though she had been born to the task. The last item is a little mechanical cardinal. The wife hesitates, holding it back. Husband says, "She buys one every year, but they never work. Can you open it and show us how to turn it on?" Girl-who-scans-so-well tries and fails to open the package. "I'll do it with my teeth!" declares Husband. 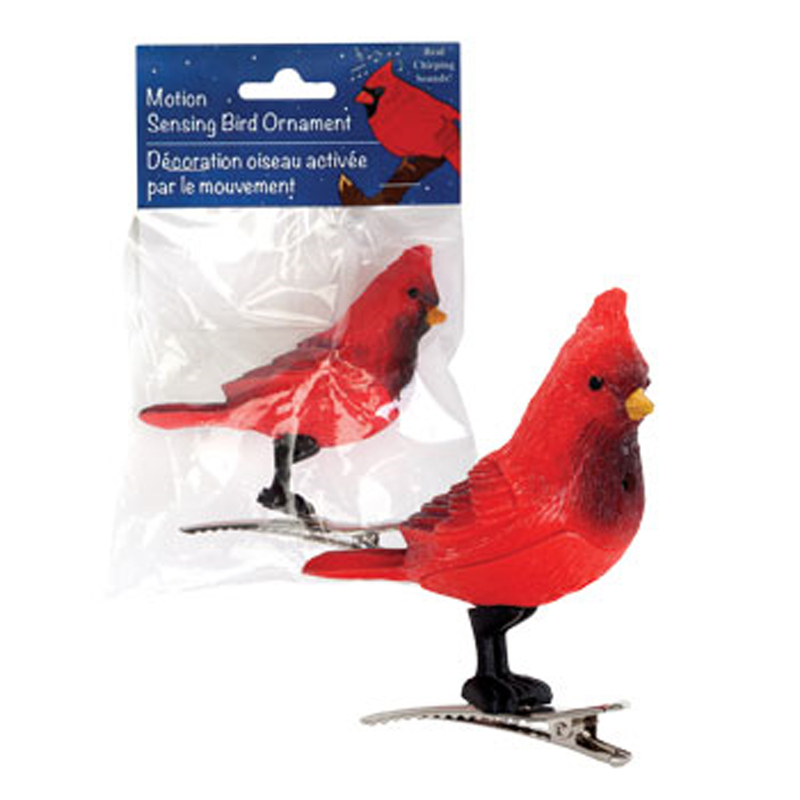 He applies his incisors and opens the package, then tips the bird into her hand. Girl-who-scans-so-well-but-cannot-open-a-wrapper, who has never taken notice of the item (or any other item in fact) before, says, "You just pull this tab," as she pulls. The bird remains as still as it had been while lodged in suffocating cellophane. "Go get another one," says Husband to the wife. She toddles off to the opposite end of the store, and returns shortly with another bird. Husband releases the new bird from its plastic prison. Girl-who-scans-so-well-and-remains-undaunted-though-she-cannot-open-a-wrapper tries again. She breaks the bird, yet the bird ekes out a series of tortured tweets. The couple is delighted by the newly audible cardinal, but they want an intact one. The folks in the growing line look on in awe as the wife toddles off to get yet another bird. This one is dropped unceremoniously into the shopping bag by the wife. They pay and leave. Girl-who-scans-so-well-but-who-cannot-open-wrappers-and-breaks-birds resumes scanning. So, well. Reading The Emperor and the Nightingale this evening by the fire. Labels: Seen it all yet? I spent half of last weekend in the company of the CiRCE Institute's president Andrew Kern, his lovely wife, and one of their great speakers, Vigen Guroian, discussing three fairy tales (Annika, you would have loved this--a taste of the course they no longer offer at Sewanee). Those who know me know that I place a good deal of emphasis on the story (see what I did there?) as education, and fairy tales were a big part of our curriculum, even on the high school level. To hear these men speak from their hearts on matters so close to my own was sheer pleasure. It was beyond amusing to hear Mr. Guroian open with the story of Nasreddin's sermon, with which I have also occasionally opened a talk. N.B. : He tells it better than I do. At the 2013 CiRCE conference Mr. Guroian spoke on King of the Golden River, one of my favorite fairy tales. The story is available in this anthology, and on Kindle here. Mr. Guroian's CiRCE talk on the story is here (check out the many other worthy selections as well). So few people I know have read this story that just meeting someone who has was nearly enough for me. But CiRCE offered far more on that rainy day. Three classic fairy tales, The Ugly Duckling, The Princess and the Pea, and Grimms' Cinderella, were given the CiRCE treatment--studied, not deconstructed; valued, not devalued; imagined, not re-engineered--to the delight of the fortunate attendees. And no feminist lenses blurred the gimlet eye as we searched for beauty in the texts. We read, they read, and we all simply talked about the stories. It would take a better memory (and ears, frankly, for the audience was not on mic) than mine to do justice to the erudition of the audience, but it thrilled me to be among them. The gentlemen themselves presented the stories to us passage by passage in close reading to help us find the good, true, and beautiful in each story. We read plenty of ugly in each tale as well, but through the ugliness we see beauty, don't we? The sessions were rather like drinking wine with experts. One tastes, takes notes, and hopes he might recall the details later. But one also enjoys the moment when the wine first hits the palate, the moment it warms in the mouth, and the finish as you reflect and anticipate the next draught. This meeting resembled a vineyard afternoon. We drank the literature deeply, and savored the flavor together. A few highlights: The notion of surrendering to beauty in The Ugly Duckling; the idea of sensitivity in The Princess and the Pea; and the truth of the communion of saints in Cinderella. Want more? Check out CiRCE's audio library. Much of the content is free, and most of the rest is a mere pittance. Perhaps these talks will be made available, but similar talks are on the website. Please, reread these stories in good translations, not simplified versions, to find the details in full. A picture book version, while beautifully illustrated, will often, at best, dumb-down the text for children, or, at worst, sanitize the text, removing all the beauty along with the ugliness, rendering the story meaningless. Can't Stop the Dickensian Discussion! Remember last week? How things have changed. Students were asked to bring in a favorite passage from our reading, or a passage they wished to look at in more depth. We read about young Jerry's imagined flight from an animated coffin. We read about the "hospital procession" and later discovered that the very excellent Stanford site could help us see that it was simply a description of a piece of furniture. And we were most disturbed to reread the chocolate preparation scene after we heard a student tell us of his research, revealing that it might be a darkly satirized Catholic Mass, a revelation which certainly changed our view of the passage. This was supposed to be our last meeting on Dickens, and our first on the next book, but the latter part of the plan did not work out. Everything we tried to discuss in the next book steered the conversation back to England and France. I have created monsters who can't stop talking about A Tale of Two Cities. The big argument? Miss Manette's role in the story. The astute students complained that she did nothing in the story. Yet, we considered the story without her; would it work? It sure would have been shorter, they mused. But that wasn't the end of the chatter. 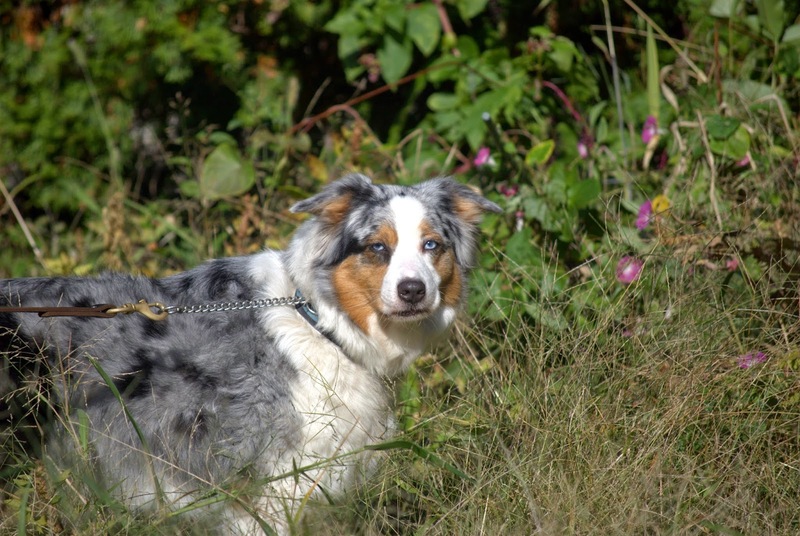 While she is not the active subject of the story, she is the object of several story lines. Is it fair to her character to say that she's the object that drives the story? Remove Miss Manette, and what motivates each character? Some considered it thoughtfully. The Usual Suspect was not stirred, and would have her removed from the story no matter how dull the story might become. In his revolution, Miss Manette would be the first to lose her head. But we don't just chat about literature. We are using the Lost Tool of Writing course as a guide to better rhetoric. The students completed a deliberative essay on TTC last week, yet several of my fine young scholars have opted to write a second essay on TTC rather than go on to the next novel. They have, it seems, discovered that there is something about Dickens, something that makes one like him more as understanding of his work grows, something revealed only by rereading, something which makes us unwilling to move on, as if moving on will mean leaving a good friend behind. In short, there is something more to be said. As an added delight, during our history lesson on the French Revolution a student announced that it was easy to remember the events because of TTC. And there was much agreement. Ask nearly anyone and you will hear that any study of any book by Dickens in any high school class was the worst of times. Many will tell you that they never picked up another book by Dickens again. Even the name of the author elicits a visceral response. My own son*, an avid reader and a fan of Dickens, was horrified by the treatment of Great Expectations in his high school class. So, when I heard that I would be teaching A Tale of Two Cities for the homeschooled high schoolers in my coop class, I was excited (such a wonderful book! ), but nervous, too. Would my method make the students hate Dickens? Would my small mob of students send Dickens to the Bastille, and call for my execution? Could anything save Dickens form the classroom treatment? The coop meets once a week. I set aside three weeks for our discussion, one for each book within the book. Since this is the first novel we are reading this year, I thought the students might have started reading it over the summer. Some did. Most finished. Those who did not were close enough to finish shortly after our planned last day of discussion. That's one small success. But that may have been the only success at that point, and I'm sad to say it. Discussion was forced and slow at times, with only brief, punctuated expressions of real understanding. Despite Dickens' long drawn-out character descriptions, the students had a hard time identifying the heroic figures. One student--a voracious reader--did not recognize which character is executed, and blamed the author's overuse of the pronoun "he" towards the end of the novel (perhaps a valid complaint!). At that point I realized I had to radically change the way I "taught" Dickens. There is no secret formula, though with my own homeschooled kids it seemed simple: Read or listen to a book together, talk about it, share passages, compare it with experience or other reading, etc. It's very natural to learn this way; leisurely reading and discussing promotes deep understanding. This does not work well in the classroom due mainly to time constraints. The students had clearly rushed the reading just for the sake of completing it on time. Of course, this is the nature of classrooms everywhere, and not the fault of the students at all. But for encouraging the sheer joy of reading, this method is fundamentally wrong. Moreover, though I have known these students for many years and despite having had countless quick book discussions with some of them, and deep discussions of Shakespeare with others, conversation was not at all spontaneous. I needed these kids to love Dickens; this was personal. With some flexibility in the class, I was able to expand discussion for another two sessions. Yesterday was the first of the two. But would anything be better? Only if I changed my approach, I thought, but how? I walked into class with no plan, but began to ask questions, as usual. Did we read this too quickly? Would you read this book again? A few weakly raised hands. If I had more time, one girl said. And there was one emphatic No from the Usual Suspect. Have you ever read any Dickens before? Yes, I read A Christmas Carol. It was shorter. So, would A Tale of Two Cities been better if it were shorter? Light bulb moment. They were excited about something. What would you have left out? Aha! The classroom mob awakened! Recalled to life, perhaps? Shouts and discussion. Intense descriptions of passages in detail. Arguments for keeping certain passages. The Usual Suspect complained that he read a long passage thinking it was so long so that it might foreshadow some other event, but was disappointed when it seemed did not. Another student countered that it did, in fact, foreshadow, and US had simply missed it. Where was the reprise? 30 minutes of debate raged on before we ran out of time. Clearly, they knew the book better than they (and I) thought they did. Clearly, they got it. Clearly, they needed more time to ruminate. I declared another week on the book, asking the students to bring their favorite passages to class, and to be prepared to defend their choices. I anticipate continued excellence and enthusiasm. We concluded the class with a reminder that the book, like many in the era, was serialized in 31 weekly installments. Imagine 31 weeks to discuss the book! Too much? Maybe, but three weeks is the worst of times. *The one who attended high school.